*Try search terms like “genetically modified foods” AND health and use facets on left to narrow by source type - choose "Limit to articles from scholarly publications, including peer-review"
AccessMedicine Collection of full-text medical books, also includes case studies, images, videos, diagnostic tools, patient education handouts, and drug information. DynaMed Plus Clinical reference tool written by physicians who synthesize the evidence and provide objective analysis to help health care providers in their daily practice. Designed to provide quick answers to clinical questions. Statistical Abstract of the United States (Proquest) Standard summary of statistics on the social, political, and economic organization of the United States – including vital and health statistics. ABI/Inform Complete This database includes articles from the business press, trade publications, academic journals, and newspapers (including full text of the Wall Street Journal). 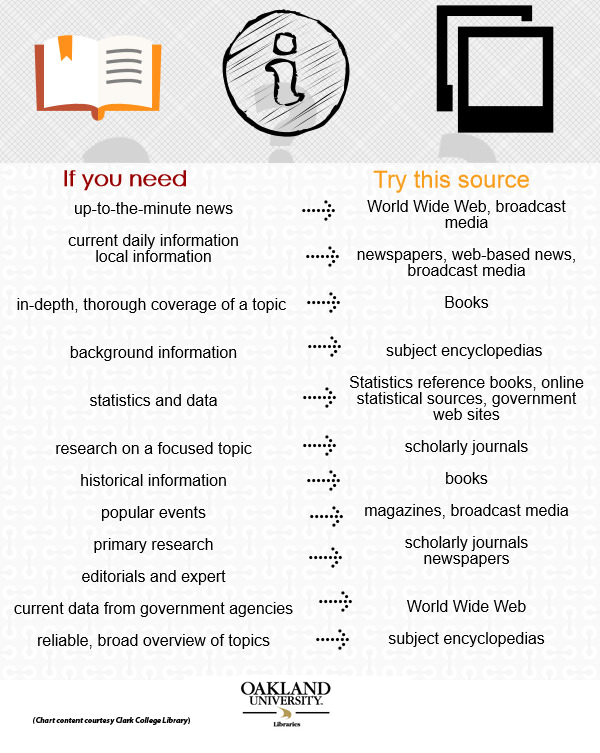 Medline via Web of Science - MEDLINE is the premier database of the U.S. National Library of Medicine. It contains over 20 million records of journal articles in the life sciences, with particular emphasis on biomedicine. Coverage: 1950-present. PsycINFO - literature in psychology and related disciplines such as psychiatry, education, business, medicine, nursing, pharmacology, law, linguistics, and social work. Social Sciences Full Text Includes full-text articles from over 300 journals, covering concepts, theories and methods from both applied and theoretical aspects of the social sciences: 1983 - present. Social Work Abstracts Indexes more than 450 social work and human services journals. Coverage: 1965 to present. Web of Science Web of Science provides access to Science Citation Index (SCI), Social Sciences Citation Index (SSCI) and Arts and Humanities Citation Index (A&HCI). AMA journal of ethics - mission is to help medical students and physicians make sound ethical decisions in service to patients and society. American journal of bioethics - provides an authoritative, annotated conversation that has been used by judges, Senators, journalists, scholars, schoolteachers, and millions of others as the key source on thousands of topics in the health sciences. BMC Medical Ethics - original peer-reviewed research articles in relation to the ethical aspects of biomedical research and clinical practice, including professional choices and conduct, medical technologies, healthcare systems and health policies. Please take a few mintues and provide feedback about today's library session. LexisNexis Academic Universe - LEGAL - court decisions, legal codes, legal news, and law journals, both at the state level and federal level. Seek Truth and Report It - Ethical journalism should be accurate and fair. Journalists should be honest and courageous in gathering, reporting and interpreting information. Minimize Harm -Ethical journalism treats sources, subjects, colleagues and members of the public as human beings deserving of respect. Act Independently - The highest and primary obligation of ethical journalism is to serve the public. Be Accountable and Transparent - Ethical journalism means taking responsibility for one’s work and explaining one’s decisions to the public. Factcheck.org has a how to spot fake or bogus news website. 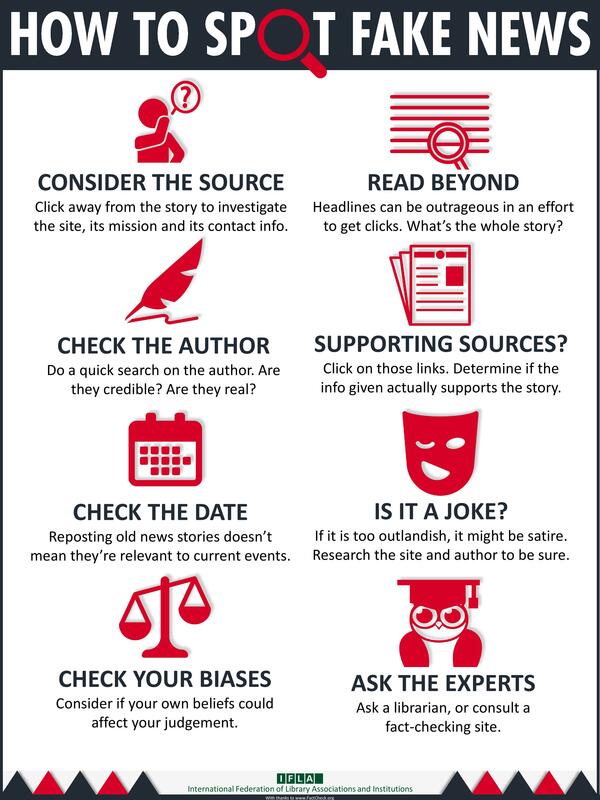 FAIR - Fairness and Accuracy in Reporting tips to spot fake news. Snopes - top Internet reference source for urban legends, folklore, myths, rumors, and misinformation. PolitiFACT- a fact-checking website that rates the accuracy of claims by elected officials and others who speak up in American politics.